By Taylor Wong, Progressive Lawyers Group. Click here for part 1. In her book “Lean In: Women, Work, and the Will to Lead”, Sheryl Sandberg exhorts women to devote themselves to work in order to shatter the glass ceiling. Sandberg, who was Chief of Staff to Larry Summers at the US Treasury, a Vice President at Google, and now Chief Operating Officer of Facebook, is also a mother of two. Sandberg asserts that, despite the gender biases in the workplace, a woman can juggle work and family as long as she is persistent and dedicated enough. 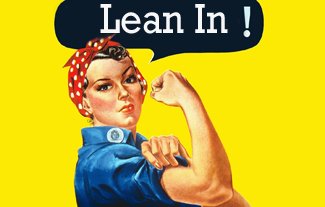 Leaning in creates a cycle of success: if a woman acts to balance her work and family life, she will not edge herself out of plum assignments, she will succeed professionally, and as she rises up the ranks, she will have more bargaining power to ask for what she needs to accommodate her schedule as a mother. While Sandberg’s words and achievements are no doubt inspiring, insufficient commitment is only one reason why there are few women at the top. In reality, women who successfully “lean in” are generally well-off, highly educated, and/or self-employed women who are in the privileged position to have the choice in the first place. Sandberg herself fulfils such criteria, but women like her are the exception, not the norm. Many working women cannot afford to choose for whom, for how many hours, and under what circumstances they work. For example, many single mothers and less educated women struggle to find jobs with good career prospects; some women have to work to support their spouse; and domestic helpers may be too expensive. Even for the women who manage to achieve great career success and have children, this does not necessarily mean that they spend sufficient quality time with them. In Hong Kong, where hiring domestic helpers is commonplace, many career-focused women rely heavily on domestic helpers to act as the primary carer at home. Clearly, “leaning in” is not a solution for the vast majority of working women, and at most can only be part of the solution even for those in the most advantageous circumstances. How, then, can women of all income and education levels combine their professional aspirations with a real commitment to (and satisfaction with) their families? First, there needs to be greater female representation on the top rungs of government, corporations and the judiciary. While this may sound like a circular argument, the “leadership gap” must be closed in order for women to be equally represented alongside men in both the private and public sectors. To achieve greater female representation, a combination of strategies should be implemented, such as alternative fee structures, telecommuting, and more flexible working hours. In theory, one of the most direct methods to address the skewed male-female distribution of labour is paternal leave. If men have the option of taking leave before and after their wives give birth (or after they adopt an infant), it could help the woman get back to work sooner, while allowing the man to spend more precious time with his newborn. However, in order for this to be effective, the leave period must be long enough to have an impact in the first place, and incentives need to be put in place to encourage families to take advantage of paternal leave. Convention No. 183, published by the International Labour Organization, calls for at least 14 weeks of paid leave for women, at least two-thirds cash benefits of previous earnings while on leave, and the benefits to be paid for by social insurance or public funds. If we use this measure as a guideline, Hong Kong fails to meet this standard. Under the Employment Ordinance, women get only ten weeks of leave, while men get a pitiful three days (both with 80 per cent of their average daily wages). Curiously, male public servants get five fully paid days. In contrast, Finland, Iceland, Lithuania, Portugal and Slovenia offer leave periods of over two weeks for men; Iceland, Finland and Slovenia lead the pack at 90 days. Furthermore, several countries such as Sweden, Germany and the UK adopt “parental leave” policies in which a bulk number of weeks are provided to a household, and the couple can decide how to allocate their time. Certain countries also provide incentives for men to take their leave days. For example, in Germany and Portugal, a mother gets bonus leave if the father takes a minimum amount of leave. In Sweden, parents are entitled to 480 days of paid parental leave, of which 60 days are reserved for fathers. If the father does not use those days, the mother cannot take advantage of those lost days. The dated view of man as breadwinner and woman as homemaker is not an exclusively Chinese concept; many cultures around the world have similar views.. However, with progressive policies and incentives, there has been a paradigm shift in countries that are willing to create more cooperative and equitable environments for working and parenting. While hard work on an individual level could pay off for some women, Hong Kong needs its own paradigm shift to make gender equality a reality. Taylor Wong is a legal eagle who likes to think, observe, and write about social issues, but still occasionally wishes to become a professional cat whisperer.